Astrimar consultants have been directly involved in the creation of industry practices such as API RP 17N for subsea systems. These recommend the setting of goals, requirements, plans and the provision of risk and reliability assurances on reliability and integrity critical equipment and new (or enhanced) technology. 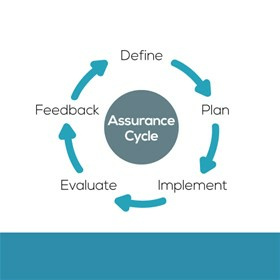 Astrimar uses the Define-Plan-Implement-Evaluate-Feedback cycle as a basis for reliability, integrity or technology assurance for projects and operations. New technology developments often involve complex, socio-technical systems, requiring the integration of data and services from a variety of sources, developed and delivered by diverse teams of designers, engineers, operators and managers. The management and assurance of reliability, integrity and qualification is often a significant challenge for the development, project or operations team. At the same time, reliability and integrity assurances need to be clearly communicated to stakeholders to give the best possible indication that the system will work. Evidence of assurance may be provided in a variety of forms, for example field and factory test data, qualification tests, reliability analyses, inspection and monitoring data. Demonstration of close out of actions arising from analysis and testing or implementation of lessons learned is also valuable evidence. Astrimar consultants can support the categorisation of evidence to ensure that there is a sufficient level of confidence in the assurance data; factors such as data sources, number of replicates, test environment and duration, model validation are reviewed to identify the degree of uncertainty in the evidence provided.